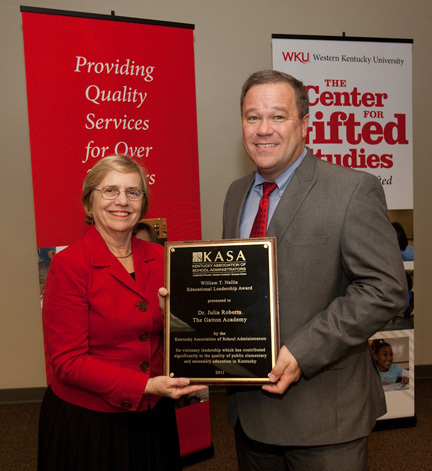 Dr. Julia Roberts, executive director of The Center for Gifted Studies and the Carol Martin Gatton Academy of Mathematics and Science in Kentucky at WKU, is the recipient of the Kentucky Association of School Administrators‘ 2011 William T. Nallia Award. 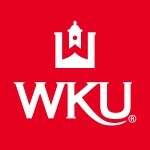 She was presented with the award Oct. 14 at WKU by KASA’s Vice President Paul Mullins, principal at LaRue County High School, and President-Elect Rita Muratalla, principal at Zoneton Middle School (Bullitt County Schools). The William T. Nallia Award honors an education leader who reflects the spirit of innovation and cutting edge leadership while bringing higher levels of success and learning to children. The award is named in honor of William T. Nallia, a KASA executive director from 1975-1986. Under Nallia’s leadership, the organization experienced tremendous growth and has since remained at the forefront of innovation in public education in Kentucky. Dr. Roberts, the Mahurin Professor of Gifted Studies, is an influential figure in gifted education on a state, national and international level. She was awarded the 2011 Acorn Award at the Annual Governor’s Conference on Postsecondary Education Trusteeship, was named one of the 100 gifts WKU has given to the world, received the very first David W. Berlin Advocacy Award from the National Association for Gifted Children, and was named one of the 55 most influential people in the field of gifted education in Profiles of Influence in Gifted Education. She serves as treasurer of the World Council for Gifted and Talented Children and president of the Council for Exceptional Children—The Association for the Gifted. She has authored numerous articles, chapters, and books, including the Legacy Award-winning Strategies for Differentiating Instruction: Best Practices for the Classroom co-authored with Tracy Inman in 2009. Dr. Roberts is also responsible for opening a state-funded residential high school for students gifted in science and math, The Gatton Academy. After 10 years of advocacy work, Dr. Roberts was able to open the doors and has welcomed her fifth class this fall. The academy was recently recognized in Newsweek as one of the nation’s top five high schools. “Dr. Roberts is a servant leader who keeps her eye on the prize. 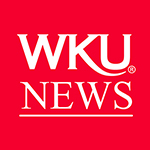 She is an extremely talented individual who has been a force in helping many students in Kentucky succeed,” Wayne Young, executive director of KASA, said. “Julia’s passion for gifted children drives her leadership vision. She communicates this vision gently, but persistently, with all she does and with everyone she meets. The kids come first,” Lynette Baldwin, executive director of the Kentucky Association for Gifted Education, said. Representing nearly 3,000 education leaders, KASA has members in every school district in the commonwealth. KASA has been connecting education leaders to policymakers, legislators and other interest groups in addition to providing numerous benefits and services to Kentucky’s school administrators for over 40 years.